Teej celebrations takes place in various parts of Rajasthan, Punjab and Gujarat. Being an important women festival, Teej is celebrated with full verve and enthusiasm. It is held to mark the advent of monsoon season and also a very important festival for engaged and married women. On this day, women pray to Goddess Parvati for long and healthy life of their husband. There are many activities performed by women to celebrate the holy festival of Teej. 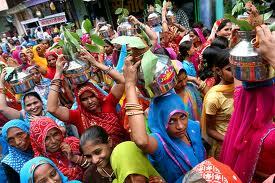 Women feel immense pleasure in celebrating the festival and make various preparations before hand. Add sugar to the boiled water to prepare sugar syrup. Take ghee in a large bowl. Add milk, flour and 1cup water. Mix together to make a smooth batter. Dissolve some color in the water with Kewra essence and to the batter. Add more water if required. Batter should be very smooth and thin. Take an aluminum cylinder or a long cylindrical container with height 12 inches and diameter 5-6 inches. Fill half the container with ghee and heat. When ghee is hot, take 50ml glass full of batter and pours it slowly in the centre of the ghee. Allow foam to settle. Similarly, pour one more glassful in hole formed in the centre. When foam settles again, loosen Ghevar with an iron skewer inserted in the hole. Place ghevar on the wire mesh to drain excessive oil. Pour hot sugar syrup in the flat bottomed container to fit in ghevar. Put ghevar in it and drain excessive syrup. Cool it for a while, cover with silver foil. Splash a few drops of saffron milk and sprinkle some pistachios and almonds with cardamom powder. Ghevar is ready to serve. 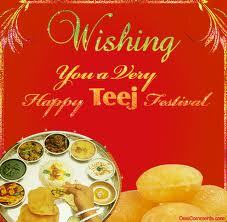 Teej Festival involves numerous activities of great fun and excitement. Married women, unmarried girls, grandmothers and even kids enjoy the festival with extreme jubilation and enthusiasm. Teej rituals and customs have created a deeper impact on its celebration. On Teej, women and especially husbands love to greet their wife in a special way. They make it a special day for their beloved by gifting them cards, Teej gifts, take them out for shopping and even post messages on websites to express their eternal love. 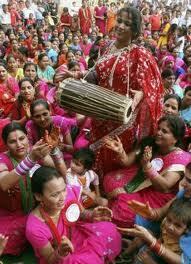 Women celebrate Teej in a very jolly mood. They dance, sing and offer prayers to Goddess Parvati. At home, special dishes are cooked for the family members. On Teej, women just love to pamper themselves and feel free to do anything.